Harold Wilson – a housing hero. Today is the centenary of the birth of Harold Wilson, winner of four General Elections and Prime Minister for eight years in the 1960s and 1970s. So why would we celebrate Harold Wilson on a housing blog? 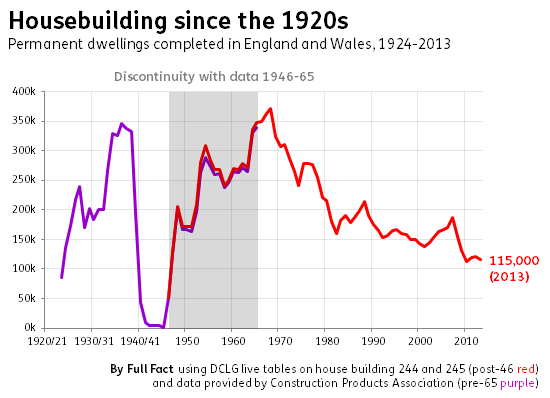 The answer is simple: as PM in the 1960s he achieved the best housebuilding figures in the last century. The chart below doesn’t lie. And as the second chart below shows, he achieved that rare double: hitting a peak in both public and private housebuilding at the same time. The outcome – over 400,000 new homes in one year – is enough to make the modern housing enthusiast’s eyes water. Housing was a big deal in Wilson’s 1964 and 1966 administrations. The 1964 Manifesto was replete with housing proposals. Development land would be publicly owned and profits retained by the community. Interest rates for housing borrowers would be subsidised and councils would be able to make 100% mortgages available. The Rent Acts would be repealed, old houses would be modernised, and if landlords failed to do so they would be purchased by the council. The 1966 Manifesto set the target of 500,000 houses a year – sadly ‘only’ 400,000 was attained. It was not just about housebuilding: the Government was committed to encouraging home ownership, and introduced the Option Mortgage Scheme to enable low income households to benefit from the tax relief policy that benefitted other home owners. There was a new departure in terms of area improvement of older housing: the introduction of General Improvement Areas. One policy that I would see as an error in the subsequent highly inflationary era is that an attempt was made to stimulate the housebuilding industry by exempting house owners from capital gains tax. We had promised to repeal the Tory Rent Act, to provide new machinery for fixing fair rents, and to give Government and all others who required them, the powers they needed to fight the evils of Rachmanism. That Bill is through the Commons despite Tory obstruc­tion. It is in the Lords – within a week of Parliament meeting again, we intend it to become law. It was on the Bill to restore security of tenure, and it was on the Rent Bill that our new Members, not I imagine to their surprise, saw the full virulence of Tory Opposition tactics when the Tories were fighting for something near and dear to them, the rights of landlords and property interests. By 1974, when two elections were won in a year, the economic prospects were much reduced. The February Manifesto however repeated the radical approach to housing: promising to repeal the Tory Housing Finance Act (which had led to rent strikes), to control rents and introduce protection from eviction for furnished private tenants, to start the ‘municipalisation’ of private renting, and to significantly increase subsidies to all housebuilding. At the time I was working with tenants in Paddington, and I recall the short minority administration in 1974 for being remarkably radical: it felt that the Government was really taking the issue seriously. For example in that one year it increased subsidy for council housebuilding by £350million – curiously the same cash figure suggested this week – more than forty years later – by the Kerslake Commission on housing in London (how small our ambitions are these days!). It also introduced a rent freeze and created Housing Action Areas – thereby keeping me busy for the following few years! The Manifesto for the October 1974 election contained the commitment to give security of tenure to council tenants – a huge advance but not actually enacted until after Labour went out of office in 1979 when the Tories found that a stronger definition of a council tenancy was a helpful platform for the introduction of the right to buy. It also repeated the promise to introduce land reform, essentially the ‘nationalisation’ of development land, and this time it was enacted, in 1976 along with the Development Land Tax legislation, but critically, by the time it was on the statute books it was much watered down and we had entered the more austere late 70s economic climate, and it was never really implemented. Wilson’s resignation in 1975 came before the 1976 ‘IMF crisis’ which put many progressive policies, including housing, into reverse. I see 1976 and not the usual 1979 as the watershed year in the UK when sound progress on most fronts was no longer to be achieved. Of course Wilson should not get all of the credit for the good things or all the brickbats for the bad – there were a succession of Ministers who did the detail. But he set a tone for Government, he oversaw radical commitments in manifestoes and he worked diligently to deliver them. Both the commitments and the delivery put our current politics to shame. Wilson died in 1995 suffering from both cancer and Alzheimer’s disease. He was the iconic figure for me growing up and developing an interest in Labour politics and housing – indeed I joined the Labour Party in response to his defeat by Heath in 1970, which was a devastating blow. 3 Responses to Harold Wilson – a housing hero. Wilsons Labour were full of good intentions and socially acceptable policies but unfortunately incompetent when it came to administering them. The lack of Strong ministerial oversight and regulation was responsible for the criminally negligent way that concrete panel buildings were constructed, leading to the demolition of many of them after only 15 years. A lot of the ones which survive to today are leaky miserably damp hovels akin to prison cells and literally “papering over the cracks” with somewhat dubious cladding can only lead to further disasters. As panels deteriorate internally it is now impossible to visually inspect them and they are rotting away quietly just waiting for the next disaster. I find much to admire about HW – his 1964 victory was the first election I worked in, relying on my dad in his LHD VW beetle to deliver the promised lifts to the polls. But Housing Hero? – not for me. Many of the 400k new homes replaced homes lost in mass demolition programmes; and a lot of the new ones didn’t last long (think streets in the sky in shoddily assembled concrete slabs.) Neighbourhoods were smashed, modest home owners expropriated, private renting suppressed. Meanwhile with Schedule A income tax (on the imputed rental value of land) newly abolished and MIRAS kept on rising interest rates, the fire was well and truly lit under the house price bubble. Owner occupation was made compellingly attractive while in the 1970s councils struggled to manage nightmarish new estates. No surprise then that the promise to turn council tenants into owners was the foundation for Thatcherism. Building 400k homes was hubris, resulting in an environmental disaster and a political disaster for the Left. Wisdom after the event of course – but those who forget their history are condemned to repeat it, or more likely, never get the opportunity to try. 1. Leasehold reform was perhaps not the best way to tackle Rachmanism. Its effects were similar to “Right to buy” – and was popular for similar reasons. 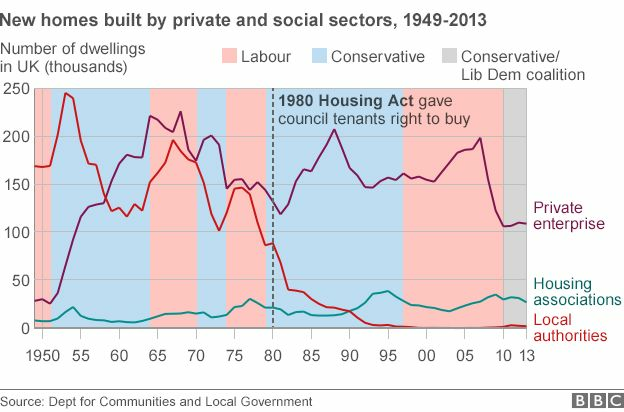 It undermined the business model of all large scale private rented sector landlords, good and bad, leading to the long run decline in that sector. That it was offset within the private sector by a rise in owner occupation was not necessarily a good thing, since it appears to have depended on the original sin of exempting home owners from CGT, the first of a series of government initiatives to keep on pumping up house prices. 2. Rising inflation will have undermined the economics of both public and private sector landlords. It was private sector landlords naturally who complained about rent controls imposed by the Rent Acts, but unless local authorities were able to increase rents in line with inflation, they will also have felt the financial squeeze, and under pressure to meet budgets, will have held back from building more council homes. I’ve not been able to find out all the details I would wish, but when Roy Jenkins balanced the budget in the last years of Harold Wilson’s first period as Prime Minister, I suspect the Treasury would have been choking off the cash for new build.